Friday 27 June 2003 was a very sad day in the Craigie house as we lost our beloved Khala () at the age of 11. She had recently developed a tumour in her colon which flared up on 26 June. In order for her not to suffer the very hard decision was made to call our vet out on the Friday. Khala spent the morning being totally spoilt and finally passed away early afternoon. We were able to take some beautiful photographs of her that day which belied what she had inside her. At Driffield Championship Show (12 October 2002) Kip went BOB (without CCs) under breed specialist Kelvin Barnes and then stole the show by winning the Hound Group under Dr. Arthur Sneedon. 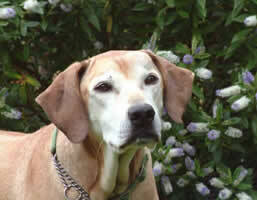 This is the only time that a Ridgeback has ever won the Hound Group twice at a UK General Championship Show. 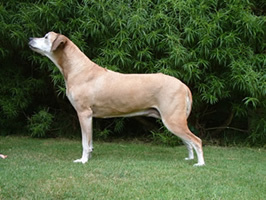 Dr. Sneeden's critique reads First was the Ridgeback, CH Imbali Kipenzi JW, outstanding representative of the breed, full of quality, sound & well balanced, moving effortlessly with great drive. The first time Kip made breed history was when he won the Junior Warrant Finals last year. Another first for the breed is the Pedigree Calendar for 2003 where May shows Kip and litter sister Zena , this is the first time Ridgebacks have featured in the famous Pedigree Calendar. Early this year we were asked if we would like Kip and Zena to be photographed for the 2003 Pedigree Calendar which is sold worldwide in 37 countries. We were under strict instructions not to mention this to anyone until the calendar was produced. The photographs were taken on the River Severn Estuary amongst the reed beds. They have come out superbly and we are delighted with the results. We hope you enjoy the photographs as well, Kip and Zena feature on the May page.